Happy first Thursday of the month! It’s time for another edition of Ask Sentai, brought to you by the brave souls who’ve sent their most pressing questions to Sentai’s ask.fm account. 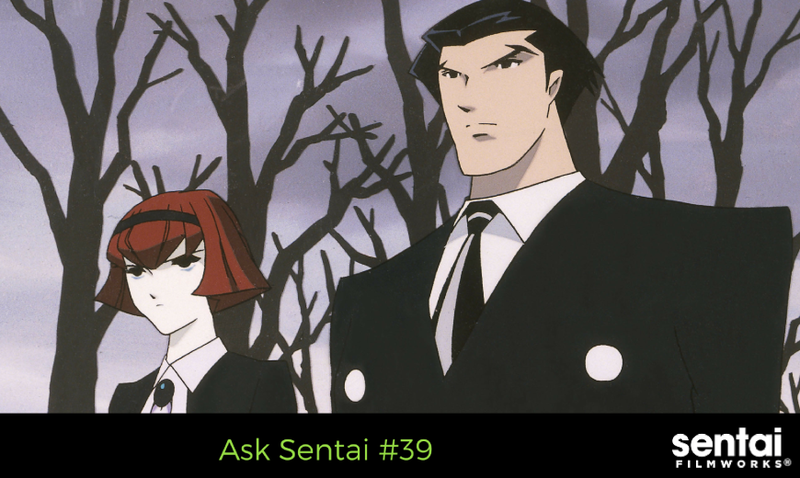 We have a nice, long, and informative #AskSentai for you today. Let’s talk about The Big O, Complete-Complete collections, and what the heck an MSRP is and why you, the fan, should generally ignore it when it comes to our releases. Since you guys will Dub Gate and Ushio & Tora for #TheDubsAreComing does that mean Gate and Ushio & Tora Season 1 & 2 should be together or there all been separate since these 2 Animes have 2 Seasons? The Big O had a number of different OP sequences since the original US broadcast and home video releases. Which OP is being included on your BD release? Sentai's release will include “Big O! Show Must Go On” as the OP. Is there anything fans could do to continue a canceled series and how could an anime get a remake? Fans could stream their favorite shows on legal streaming sites and purchase merchandise. The more the industry can measure how much fans like a show, the more likely they will be inclined to continue a series. We're still hoping for seasons 2s of our favorites. I noticed Bryson Baugus will make his debut lead role in the DanMachi dub. Any other up-and-coming voice actors you guys want to give a shout out to? We wouldn't ruin a surprise like that on ask.fm. C'mon: our actors deserve better. How are you guys going to announce English dubs from here on out? Separately throughout the year or all at once like your past video? Mwuahahaha. That depends on timing. We would like to announce in bulk like in the past, but we think that elements of surprise throughout the year are nice too. I've got another Big O question as well. I noticed that the Japanese Blu-ray had commentary. Is it safe to say that the US BD won't feature that commentary? Correct. This release does include a cast interview. Sometimes it depends on whether or not there are Blu-ray materials for that. For example: Azumanga Daioh. We released it as a Sentai Selects DVD because there were no BD materials for this title. There are lots of reasons why a BD can't be released to the market, but for the most part, we try our hardest to get you guys the BD treatment. you guys licensed trinity seven, will you also license the new movie that just came out? Thank you for the suggestion! No news yet, but glad to know you want it. Will you be updating the Majestic Prince Complete Collection to include Episode 25? I always wonder how you chose who to cast in certain voice roles in anime dubs? What factors are there? How many recording sessions are done, and how long does it take to produce an anime dub? That's a lot of questions, and none of which have a "constant" answer. The short answer is: it depends. The length of the show, the number of lines per episode, and amount of characters all play into how long it takes to complete each dub. Casting, though, is helmed almost entirely by the director's creative genius. I saw the School-Live dub announcement recently, which was purporting to be day 1 of auditions. Meanwhile, the site shows a release date in June, only four months later. Is dub production turnaround really that fast? If so, wow! Colour me surprised! Never said it was "Day One," just that there happened to be auditions on the day of filming. The timeline varies per show, but you can be sure that School-Live! will be available by streetdate. How come you can't mention anything on ask fm that hasn't been officially announced to the press yet? Ask.fm is not for confirming upcoming dub releases or home video announcements. It is, however, good for suggesting future dubs and collector’s editions and asking questions about the industry. Got a question? Send it to Sentai’s Ask.fm! We’ll see you next month.